Unfortunately for France, the 1930s was a revolutionary decade in the history of aviation development. While the nation’s aviation industry was in the lead at the beginning of the 30s with the introduction of the Dewoitine D.500 and D.510 monoplanes, the pace of development was such that these airplanes were essentially obsolete within a year of their entry to operational service. A specification for a more advanced fighter was issued in a timely manner in 1934, but - with the nationalization of the industry in 1936-37, which threw everything into turmoil - the product of that specification did not enter production until 1938 and did not enter service until 1939. By that time, further technological advances had overtaken what was by then known as the Morane-Saulnier M.S.406, and it was outclassed by the further development of its primary opponent by the time it saw combat in 1940. The Service Technique Aéronautique (Aeronautical Technical Service) of the Armeé de l'Air issued a requirement for a new and completely modern single-seat fighter - referred to as a “C1" design - utilizing the monoplane layout and retractable landing gear. Among the companies responding to this was Morane-Saulnier - which had been among the leading suppliers of French combat aircraft since the beginning of the First World War. The design was known as the M.S.405, and was a departure for the company, being the first low-wing monoplane, first enclosed cockpit, and first with retracting gear. Prior to this Morane-Saulnier designs were fixed-gear parasol monoplanes developed from the 1918 A.1 fighter - which at the time was one of the most advanced airframes in existence. The M.S.405 was of mixed construction, with fabric-covered wooden control surfaces, and using a bonded metal/wood material known as Plymax for the wings and tail surfaces. Plymax was a thin sheet of duraluminum bonded to a thicker sheet of plywood; this was considered to be lighter than an all-metal structure, which was important because the French had not yet developed a truly high-powered engine such as the English Merlin or the German Daimler-Benz series. The first prototype flew on August 8, 1935, powered by a new 860 hp Hispano-Suiza HS 12Y-grs engine driving a two-pitch Chauvière propeller. Development was extremely slow; the second prototype with a 900 hp HS 12Y-crs engine did not fly until January 20, 1937, nearly 18 months later. The second prototype reached 275 mph - equal to what was known regarding the new Messerschmitt Bf-109B that was just entering Luftwaffe service. This led to an order for 16 pre-production prototypes. The result of all the changes introduced during the production of the 16 pre-production airplanes was the M.S.406. Two main changes were a new lighter-weight wing structure and a retractable radiator. Using the production 860 hp HS 12Y-31 engine, the M.S.406 had a top speed of 304 mph. Armament was a 20mm Hispano-Suiza HS-9 or HS-404 cannon with 60 rounds firing through the prop spinner, and two 7.5 mm MAC 1934 machine guns in the wings with 300 rounds each. This was considered superior to the four 7.62mm machine guns it was known armed the Bf-109C and Bf-109D that were then joining the Luftwaffe. By this point, war with Germany was clearly looming. The Armeé de l'Air ordered 1,000 M.S.406C.1's in March 1938. Morane-Saulnier was incapable of such volume production at their factory, which led to a second line being established at the nationalized factories of SNCAO at St. Nazaire. Production finally began in late 1938, with the first production aircraft flying on January 29, 1939. The Armeé de l'Air began to take delivery of the M.S.406C.1 that March. By April 1939, six aircraft a day were being delivered. When war came on September 3, 1939, production had increased to eleven per day, and 535 M.S.406's were in service. Production ended in March 1940, when the original order for 1,000 was delivered to the Armeé de l'Air. An additional 77 M.S.406s were produced for foreign air forces - 30 for Finland and 45 for Turkey. Additionally, the Swiss Air Force undertook licensed production of the M.S.406 as the D.3800. Throughout its production, engine shortages slowed delivery of the M.S.406. By the time of the German invasion on May 10, 1940, the M.S.406 and the Curtiss Hawk 75 were the two most numerous fighters in the Armeé de l'Air. Unfortunately for the M.S.406, it did not face the early Bf-109s it had been designed to opposed, but was sent up against the vastly-superior Bf-109E, which had a 50 mph speed advantage, as well as two 20mm cannon for armament. The M.s.406 underpowered, under-armed, and too lightly armored to stand up to the hitting power of the Emil’s armament. Lacking armor plate or self-sealing fuel tanks, the pneumatic systems it used meant one bullet in the right place would render the entire aircraft inoperable. Between May 10 and the French surrender on June 22, 400 MS.406s were lost in combat, with the type scoring only 175 victories in return. By the time of the surrender, there were fewer than 200 M.S.406s left in operational condition. The Vichy Armeé de l'Air de l'Armistice continued to operate the M.S.406C.1 until 1942, with two squadrons seeing action in Syria in 1941, while the two squadrons stationed in French Indochina saw action against the Thai Air Force in 1941 and were operated by the Vichy authorities in Indochina until 1945. While the M.S.406 fared badly against the Luftwaffe, the Finnish Air Force used the 30 they had ordered in 1939 and a further 46 purchased from the Germans in 1942 to good effect in their battle against the Red Air Force, with several Finnish pilots becoming aces with the airplane. Eventually re-engined with the Russian M-105 - a direct development of the Hispano-Suiza HS 12-Y - the MS.406s finally saw service after the war as trainers, being taken off operations in Finland in 1948. The Swiss used their D.3800s to enforce neutrality throughout the war, though they were glad to obtain newer airplanes from Germany. The Turks used their M.S.406s as fighter trainers until the early 1950s. M.S.406s captured buy the Luftwaffe in 1940 were the first fighters to equip the collaborationist Croat Air Force in 1942. As an airplane, the M.S. 406 was considered generally free of problems and was equal in performance to its contemporaries. Unfortunately, its contemporary was the Jumo-powered Bf109B-D series, and the French designers did not keep up during the crucial two years prior to the outbreak of war. The first M.S.406 kit I remember was one in1/72 released by Heller in the late 1960s, which was good for its time. Other 1/72 M.S.406s have been released over the years, most notably by Hasegawa some ten years ago. In 1/48, Hobbycraft released their idea of an M.S.406 in the late 1980s, while Classic Airframes released one around 1999-2000. There was an additional kit done in resin by J.M.G.T. in France during the 1990s, which was developed from a vacuform they first released in the late 1980s. Unfortunately, all of these kits suffer to one degree or another from an inability to get the subtle shape of the M.S.406 right. In 1/48, Hobbycraft’s kit isn’t even particularly close, while the J.M.G.T. kit was pretty expensive for its failure to deliver accuracy. Classic Airframes version looked more like an M.S.406 than either of these, so long as the viewer was at least 18 inches away. A resin correction set from MDC fixed the problems, but at a cost nearly equal to the original cost of the kit. 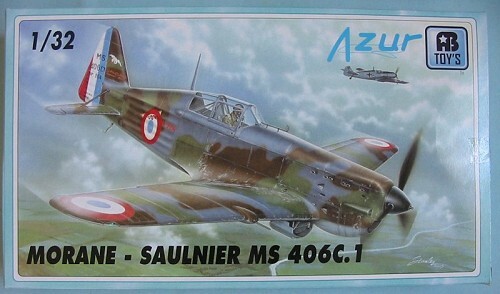 This new kit from Azur - one of the MPM companies - is the first M.S.406C.1 in 1/32 scale. 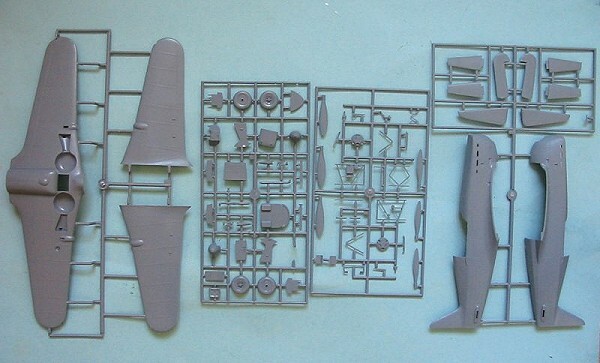 While I don’t claim to be any sort of expert on the airplane, modelers in Europe who are both more interested in it and more knowledgeable have been saying since this kit was released that it is the most accurate yet. Comparing it with drawings I was provided a few years ago to demonstrate the problem with the Classic Airframes kit, I am inclined to agree with these folks. Overall, this is also the best 1/32 kit so far released by MPM. It looks better and more detailed than either the Azur D.520 or the Special Hobby I-16 kits, with a lot of fine detail in the cockpit and is the equal of the C.200 “Saetta” MPM recently did for Pacific Coast Hobbies. The surface detail is nicely restrained and the fabric surfaces look a lot more like what fabric surfaces should look like than one usually gets. The injection-molded canopy is in separate pieces and is commendably thin and very clear. 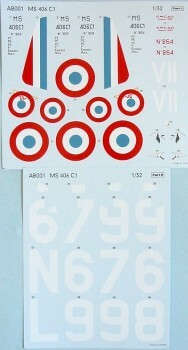 Decals are provided for two separate Armeé de l'Air aircraft from 1940, and look to be of good quality and color accuracy. Given the quality of this kit and the newfound popularity of 1/32 scale, one can hope that aftermarket decals will show up soon to do Finnish airplanes and the M.S.406s flown by the Polish squadrons serving in the Armeé de l'Air from the fall of Poland to the French surrender. This M.S.406C.1 is another entry in the growing collection of good-quality 1/32 models. Super-detailers can have fun with this while those of us who enjoy painting on a “larger canvas” will also get an outstanding result, given the level of detail provided in the kit.